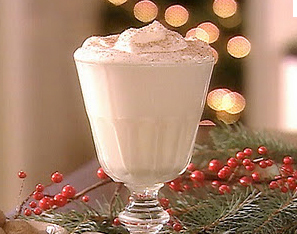 Eggnog – Love it or hate it? Eggnog is the black licorice of Christmas. You either love it, or…NOT. I am in the love it camp. The real thing, made at home, is the best. I like it a little thinner, so I use half and half instead of cream, and then a little whole milk if it’s still too thick. Some recipes call for cooking the eggs, and some recipes call for raw eggs with a whole lot of liquor, which cooks the eggs, or sterilizes them, or just sterilizes your stomach, I don’t know which. Here’s Paula Deen sharing her recipe that calls for only a wee amount of liquor per serving, and uses milk and cream . Alton Brown also has a recipe on the same site. with versions for cooked, and uncooked eggs. Both recipes are highly rated. The Eggnog that takes the cake for liquor amounts is from Epicurious. It is highly rated, and it is the uncooked kind. Looking for a lighter version? Try Cooking Light’s recipe. Their recipes are always winners. If you buy it at the store, look for the “light” version and doctor it up with the liquor of your choice. My favorite additions are Kahlua and rum, or Kahlua and brandy. I think the coffee flavor compliments the sweetness, plus the bite of the brandy keeps you from chugging the whole mug. Don’t forget the fresh ground nutmeg. This will make it seem almost homemade…. Speaking of mugs, I think eggnog should be served in some kind of festive mug, not a juice glass for the love of Christmas. It’s a special drink, and should be treated with the respect it deserves. Thank you for this foray into the secret world of eggnog. What Paula Dean and the rest do not disclose is that eggnog can only be made and drunk during the holidays because of the particular solar requirements and atmospheric pressure in the Northern Hemisphere needed for the chemistry of the cream, milk, eggs, and nutmeg to combine together properly. This is not the case with lemonade, which can of course be made and consumed all year round.